Join us for a wonderful shopping experience and opportunity to visit our farm on Saturday, December 1st! 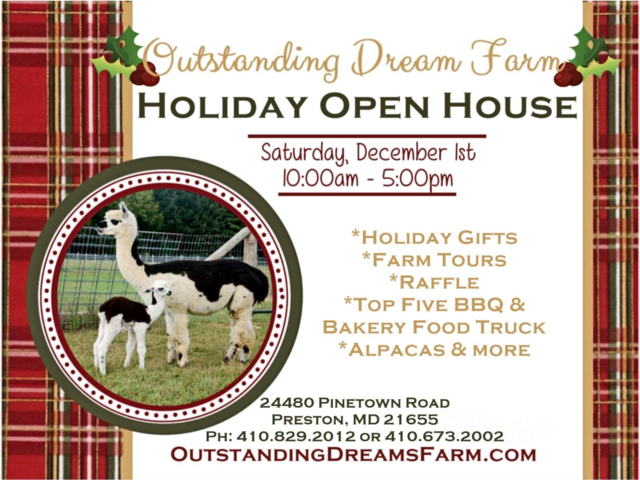 Outstanding Dreams Alpaca Farm will host the Annual Holiday Open House in Preston, Maryland from 10:00 am until 5:00 pm. Our retail store offers a wide range of fiber products, apparel and accessories crafted from the luxurious fleece of alpacas, providing an excellent option to purchase gifts of quality. Enjoy strolling the farm and seeing our friendly alpacas, while the kids enjoy visiting with Mrs. Claus and enjoying holiday treats. Questions about alpacas? Owners Phil and Vickie will be on hand to answer questions about these lovable creatures and you can even see the animals up close. Don't forget to bring a camera for some great photo opportunities! What can you expect to find in our Farm Store? From blankets to sweaters and accessories to socks, we have a wide selection of products crafted from luxurious alpaca fiber to ensure you will find a gift for anyone on your list. Our premium alpaca yarn, made from the animals right here on the farm, is available in many colors and weights and is 100% Maryland Made. 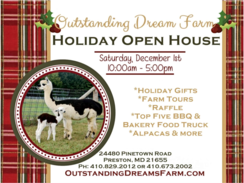 For more information and to plan your visit to Outstanding Dreams Farm, please feel free to contact us by phone at (410) 673-2002 or visit our Facebook Page for the latest news and updates. Click here to view some of the festivities and photos from last year's open house. We look forward to seeing you here!